As September comes to a close everything is finally starting to come together. 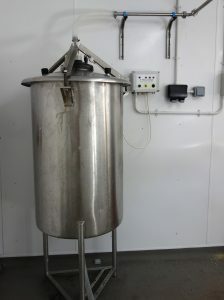 The milk tanks are now installed in the new dairy room and fully working, and the milk vessel and pumping system is all up and running to get milk across from the main tank. Just waiting on the pasteuriser, cream separator and bottle filler to slot into the gaps. So avoiding any disasters the micro dairy should be up and running at the end of October. And milk and cream on sale once we have food safety sign off in November. We can start making Cheese from the pasteurised milk from then and fingers crossed should have some batches matured for Christmas. We have been trialling some changes to the cheese makes and have a new style on the way which we are very pleased with so far. This month has included the national Red Tractor week promotion, Trust the Tractor. We had our farm assurance audit in the summer and passed which means the milk we sell can go into red tractor labelled products. The Red Tractor farm assurance covers animal welfare, food hygiene, traceability and environmental management so is a really good way of checking that the cows are well looked after as well as showing the products are made, stored and treated appropriately. Once the dairy is up and running we will start looking at whether to get certification for our own products as well which means getting additional specialist audits for the dairy and cheese room itself as well as the existing one for the milk. 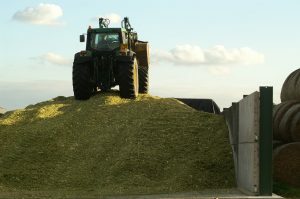 It has been busy in the fields too with the maize silage finished this week. This, with the grass silage will make up the bulk of the cows winter feed and they are always keen to start eating it as soon as it is ready.